2016 marks the beginning of the transition of the counter-piracy response in the Horn of Africa. Many states have already significantly reduced their involvement in counter-piracy. Recent revisions of the counter-piracy architecture raise the question of what the future holds for the main coordination body, the Contact Group on Piracy off the Coast of Somalia (CGPCS). Recently, the High Risk Area has been revised, which documents that international stakeholders are altering the approach they take to contain piracy. While the US-led Combined Maritime Forces (CMF) have announced in July 2015 to continue their operation, the mandates of the two other missions, NATO’s Operation Ocean Shield and the EU’s EUNAVFOR Atalanta, are under review. There are clear expectations that the EU will continue the mission in one form or another and maintain the Maritime Security Centre Horn of Africa, important for situational awareness in the area. These developments need to be seen against the backdrop of the assessment that no large scale piracy attack was successful since 2012. Notwithstanding, the threat of piracy in the region persists. This is clearly highlighted by the 2015 threat assessment of the military missions and further evidenced by recent reports of low scale hijackings and hostage taking attempts. The CGPCS is a major cornerstone of the response. It ensures that the activities of the diverse stakeholders are in sync and gaps are spotted and filled. The CGPCS is a flexible, informal, and multi-lateral mechanism, and over the evolution of the fight against piracy it has been frequently reformed and redesigned. The CGPCS stakeholder community, however, so far lacks a clear strategic vision, and the debate on the future of the group is in full swing. Indeed, the Government of the Seychelles, the 2016 chairman of the group, announced to make the question of how the legacy of the group can be secured one of the top priorities. In February 2016, the CGPCS held a strategy meeting in Mumbai. At the meeting, the stakeholder community was in agreement that the group should be reformed. Yet, what direction this implies and how the legacy could be secured remains an open question. What are the options for reform? 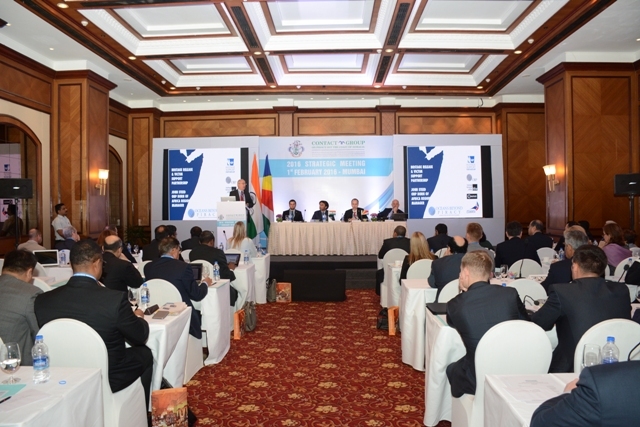 Three proposals were made by the stakeholder community: Firstly, a functional extension that implies to widen the mandate to include other maritime security issues while maintaining the current regional focus on the Horn of Africa and the Western Indian Ocean. Secondly, a regional extension in that the group starts to work on other piracy hot spots; and thirdly, a further streamlining of the work of the group with the perspective of transferring the plenary to another institution in the long run. Each of these options requires further scrutiny. The following provides a short analysis of each. Functional Extension: A Contact Group on Maritime Security in the Western Indian Ocean? By now, it is widely acknowledged that piracy is a maritime security issue which can only be understood in a wider socio-economic context. Piracy is part of a maritime insecurity environment in which different threats and forms of transnational organized crime, in particular fishery crimes, are linked. Also, current capacity building projects can hardly be understood as isolated piracy responses. Initiatives geared at maritime security sector reform, regional law enforcement operations, maritime situational awareness, or training of maritime security forces by virtue deal with the broader maritime security environment. Indeed, the majority of current capacity building projects, including the Djibouti Code of Conduct’s training activities, the EU’s Crimario, MASE and EUCAP Nestor projects, or UNODC’s Indian Ocean Maritime Crime Forum address maritime security more broadly. Over the last two years, the agendas of the CGPCS working groups and the plenary have substantially considered such a broader focus. The Working Group on Capacity Building, de facto, deals with general maritime security sector reform in Somalia. The Working Group on Mitigation and Operations at Sea has regional maritime situational awareness as its primary agenda item. During the chairmanship of the European Union (2014-2015), the plenary discussions included other substantive issues than piracy, with presentations concerned with fishery crimes and the broader maritime security capacity building projects. In practice, the CGPCS, hence, has already broadened its mandate and started to act as an oversight and coordination body for maritime security in the region more widely. From this backdrop the proposal to formally widen the mandate of the CGPCS to include other issues than piracy, brought forward in particular by states from the Western Indian Ocean region, appears not only to reflect actual working practice better but also develops the CGPCS in a promising way. In this scenario, the CGPCS would become an innovative type of regional organization, particularly concerned with the governance of maritime security in the region, regional cooperation and capacity-building in collaboration with the international community. The option could be initially pursued by adding new working groups (e.g. on fishery crimes, maritime situational awareness, or joint law enforcement). The downside of this option is that broadening out the mandate in a systematic manner would imply to widen the stakeholder community participating in the group significantly. It would mean, for instance, to include actors that deal with the fishery sector or environmental regulation in the area. The revision would also entail to re-brand the group including a new name. This might raise potential concerns over the legitimacy and the status of the group given its link to the UN Security Council mandate (see below). Considering the decreasing momentum of the international community, this option would only be realistic with strong regional leadership. Regional Extension: A Contact Group on Piracy? At present, there are three major piracy hot spots. In addition to the Horn of Africa, these are the Western African Coast and Southeast Asia. It is widely acknowledged that the type of piracy activities, as well as the scale of attacks, differ considerably. Piracy in West Africa or Southeast Asia r tend to be incidents of theft and robbery rather than hostage taking. Also, the local political situations in which piracy is embedded differs. State failure is not necessarily an issue, and incidents tend to take place in territorial waters and Exclusive Economic Zones, rather than on the high sea. There are, however, also a range of similarities. The victims of piracy are the same (the international shipping industry); many stakeholders are active in all three regions (e.g. Oceans Beyond Piracy, the International Maritime Organization, or the International Chamber of Commerce), and the responses that have been developed have a similar character. With the G7++ mechanism, Western African piracy is the object of a coordination mechanism similar to the CGPCS. That cross-regional thinking is productive has become particularly visible in capacity building. Both, the Djibouti Code of Conduct as well as the West African Yaoundé Code of Conduct processes, have been inspired, if not directly copied, from the South East Asian Regional Cooperation Agreement on Combating Piracy and Armed Robbery against Ships in Asia (ReCAAP). The Maritime Situational Awareness Centre, installed through the MASE project, takes the Singaporean Information Fusion Centre as a role model. Moreover, there are discussions in how far the Best Management Practices introduced for the Horn of Africa can provide a tool in other piracy-infested areas as well. Creating a global piracy contact group, that is, extending the mandate of the CGPCS to cover other regional hotspots, is a proposal put forward by international actors. The plenary would address cross-cutting issues while working groups would be dedicated to distinct regional hot spots. The main advantage of this option is that it would allow for streamlining counter-piracy work across regions and ensure the speedy transfer of best practices, lessons learned and ideas. Discussions on how to organize the relation between states and the industry or on the content of global best management practices could be effectively pursued in such a body. A global piracy contact group would, moreover, be in a better position to react to any future piracy outbreak. Thus far, piracy is an international issue that still does not have an appropriate home in the global security governance architecture. Regional extension of the group could provide an ideal solution to this problem. Pursuing this option would, however, require a broad international consensus and strong global leadership from the G7 or BRICS states. The main challenge of this option lies in the substantial increase in the numbers of actors involved. While there is an overlap in stakeholders to some degree, additional regional states, regional organizations, and capacity building agencies will have to be included. Many governments do not have cross-cutting maritime security agencies, but deal with piracy only in regional departments, and would hence have to send larger delegations. Extending the work to other regions, moreover, adds considerable complexity and hence might undermine the likelihood that the group can achieve consent. Finally, and as further addressed below, such an extension would also raise concerns about the legitimacy and the overall mandate of the group. Critiques of the former two options have argued that extending the mandate would require external authorization by the UN Security Council. Whether formal approval in the form of a UN Security Council resolution is indeed needed, remains an open question as legally the relation between the UNSC and the CGPCS is ambiguous. The UN Security Council passed Resolution 1851 on 18 December 2008. It encouraged, “all States and regional organizations fighting piracy and armed robbery at sea off the coast of Somalia to establish an international cooperation mechanism to act as a common point of contact between and among states, regional and international organizations on all aspects of combating piracy and armed robbery at sea off Somalia’s coast”. Although this indicates that the CGPCS has a mandate from the UNSC, participants in the CGPCS have frequently emphasized that it is not a UN body. While the first communique of the CGPCS notes that it was established, “pursuant to UNSCR 1851”, for instance, the former CGPCS chairperson Donna Hopkins highlights that, “the CGPCS was deliberately established outside the UN system to ensure that it was as inclusive, apolitical, issue-driven, result-focused, efficient and flexible as possible”. The deliberate distance to the UN is also reflected in the working procedures of the CGPCS, which are not following UN rules, but are ad hoc and informal. However, a case to the contrary can be made as well. Arguably the CGPCS gains its legitimacy from the UNSC resolution. Given that it has become a custom by current CGPCS participants to interpret the CGPCS as having a UNSC mandate, we might face a case of customary international law. In principle, however, the mandate of the CGPCS could be extended if participants are in consent (or there are no objections). A UN Security Council resolution is no requirement. The CGPCS assumed its work in 2009 with four working groups. Part of the organizational evolution from 2009 to 2012 was to add new bodies, such as the Capacity Building Coordination Group, or Working Group 5 and its technical sub-body the Law Enforcement Task Force. Starting out with the 2013 counter-piracy week in Djibouti, and in particular since the strategy meeting held in Paris in January 2014 the CGPCS has been continuously streamlining its work. At the Djibouti meeting, working groups were held for the first time back to back with the plenary, rather than independently. This has become an established practice since. Following the Paris meeting, the number of working groups were reduced to three. Since 2015, the number of plenaries has been reduced to one annually. The 2015 plenary was the first that was streamed online, allowing stakeholders to follow procedures from a distance. Overall the workload of the group has considerably decreased. This reflects the fact that the counter-piracy system put in place works, and that the number of challenges and issues that require attention have been reduced. Streamlining also took account of the fact that several of the issues on the CGPCS agenda are in the meantime also handled by other bodies, including initiatives such as the maritime security strategy of the Indian Ocean Rim Association, the African Union’s 2050 African Integrated Maritime Strategy, the Indian Ocean Maritime Crime Forum, and the United Nations Political Office for Somalia. A third option for the group, put forward in particular by G7 states, is to continue further streamlining with the scenario of transferring the remaining tasks in the medium turn to another institution. This option would imply to reduce the number of working groups and sub-bodies gradually. Initially, this could mean to have two working groups (one on Somalia and one on the Western Indian Ocean region) while the Law Enforcement Task Force would report directly to the plenary. In the next step, all activities could be condensed in one annual plenary. This annual plenary then would be transferred to another institutional body. Such an option would acknowledge the work done by other organizations and reduce the overall workload. It remains pivotal to strategize which of the plenary functions could be transferred to other institutional bodies. Potentially the annual plenary could be held in the frame of the Indian Ocean Rim Association, the UN Adhoc Committee on the Indian Ocean Zone of Peace, or eventually UN Oceans. None of these organizations, however, seem at present ready to take over such a role. A further streamlining of the CGPCS, moreover, might reduce the group to a skeleton in which the political momentum needed to address piracy in a sustainable manner is lost, and the consensus among the international community becomes fragile. It is a well-known fact from International Relations scholarship that international organizations die hard. Once they have established routines, they tend to perpetuate themselves independently from how the problem for which they have been designed develops. Without a doubt, also the CGPCS will show this tendency. If the group has established routines over the years, it, however, remains an informal ad hoc body that has shown considerable flexibility and adaptability. The current chairmanship of the group has declared securing the legacy of the group its main objective. Yet, what this legacy is remains unclarified. Definitely, the CGPCS has proven how effective multi-lateral governance can be if it is inclusive, informal and experimental. This has been clearly shown by the CGPCS lessons learned project. Part of the legacy is hence the development of a working tool that can be used to address other global issues. To make a fully convincing case that the tool works, however, also implies to demonstrate how the CGPCS is further transformed and how the elements of its work still required are continued. The discussion on the long-term strategy, whether in the form of reform and transferring the CGPCS or extending its work, has started in 2013. So far, however, this debate has not reached the centre stage, with stakeholders being busy with pragmatic, short-term politics, rather than seeing the big picture. The success of the current chairmanship will be measured in how well it can organize this strategic discussion, and eventually bring it to a conclusion. Each of the options outlined are plausible ways to go ahead. Extending the mandate will require big thinking and considerable efforts. If streamlining offers the easy and pragmatic solution, it does little to solve the future quest, if the issue of a transfer is not addressed. Dr. Christian Bueger is Reader in International Relations at Cardiff University. He currently works on a research project on counter-piracy governance. He is one of the lead investigators of the Lessons Learned Project of the Contact Group on Piracy off the Coast of Somalia and an associate editor of piracy-studies.org. He can be contacted at buegercm@cf.ac.uk. Further information is available at his personal website. Bueger, Christian. 2015. Learning from Piracy: Future Challenges of Maritime Security Governance, Global Affairs 1(1), 33-42. Tardy, Thierry. ed. 2014.The Contact Group on Piracy off the Coast of Somalia (CGPCS). A Lessons Learnt Compendium, Paris: EU Institute for Security Studies. Website of the Lessons Learned Project of the Contact Group on Piracy off the Coast of Somalia.